Caroline led the nation in rushing with 1256 yards as a sophomore at Illinois, but was declared academically ineligible the next year. He spent 1955 playing for Toronto and Montreal in Canada, where he rushed for 575 yards in 10 games. Eligible for the NFL draft in 1956, he was taken by the Bears in the 7th round and was used on defense until injuries depleted the backfield later in his rookie season. Bears went 9-2-1 to finish first in the Western Conference. Lost NFL Championship to New York Giants (47-7). 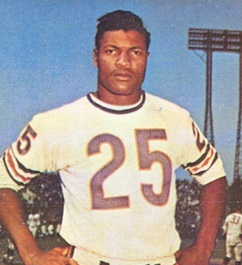 Caroline continued to be a versatile performer with the Bears over the course of a 10-season career that ended in 1965. He saw action on offense and as a kick returner in 1957 and ’58 but was most effective on defense where he was used at both cornerback and safety. Caroline intercepted a total of 24 passes and scored six touchdowns, three of them on offense.